Today is World Menstrual Hygiene Awareness Day, a day to raise awareness of the challenges women and girls worldwide to face due to their menstruation, and highlight solutions that address these challenges. While periods might seem like normal natural things in the many western worlds and Europe, in developing nations such as Nepal and India menstruation is still taboo, and something that many girls are made to feel ashamed of. In fact, 1 in 5 girls in Nepal will miss school because of their periods, being too worried and embarrassed to attend school during that time of the month. We teach them how these reusable pads are beneficial for not only to have every girl to go to school but how these pads are decomposable and protect our planet from being polluted and whereas plastic pads take 800 years to decompose. We see the change happening in the class in 30 mins, in The beginning, all the students are so shy and embarrassed even hearing about menstruation word but after a while the whole class gets comfortable and their mind soul and all the conscious gets change with information and having those pads gets them reminded to not forget, So far LWH has distributed more than 6000 Sanitary pads. Just recently we have made 2000 pads and distributed in Terai region. One of the stories that we would like to share with you today is from the boys of Shree Secondary School, Maruwa in Katari Municipality-4 of Udayapur have done something that has raised a lot of eyebrows. They have been collecting a portion of their lunch money to purchase sanitary pads for girls to use during menstruation. "There are more than 600 students in the school and all of them collect some portion of their lunch money and put it in the donation box every month," said Shyam Prasad Dahal, a teacher, adding, "That money is used for buying sanitary pads, soaps, and other cleaning items required during menstruation." Kopila Raut, secretary of a local children's club, informed that the male students do this to help their female friends. "But this is not practiced in nearby schools," she said. She further informed that these days’ students also participate in discussions related to reproductive health. In order to make sure that no girl misses her school during periods, most of the schools in Udayapur have launched Menstrual Hygiene Management Program. The main purpose of this program is to free the girls from the problems they have to deal with during periods. This campaign has helped eliminate the hush-hush attitude regarding menstruation and made it a topic of open discussion. "Not just the students but even we female teachers had to suffer a lot during menstruation but no more, thanks to the changed perspective," said Urmila Khadka, adding, "This has also improved the attendance of girls." According to Narayan Prasad Adhikari, principal of the school, earlier the fear of stain compelled girls to skip their classes for five days during periods but now they attend their classes despite menstruation. The school has also constructed a girls-friendly toilet for them. Sourced by Republica. This program should be extended to other parts of the district as well so please sponsor our mensuration project and become part of the change that you want to see in Nepal, In 2018 none of the girls should miss the school due to her periods. Our new range of fair trade Kaftans just launched in Australia, empowering and inspiring women around the world. The South Asia monsoon season of 2017 brought the heaviest monsoon rains recorded in the past 30 years resulted in severe flooding. More than 1,200 people have died across Nepal, India and Bangladesh and 40 million people have been affected, by destruction of houses, infrastructure and agriculturei. In Nepal, heavy rains starting in August caused floods and landslides resulting in tens of thousands of houses destroyed, families displaced and 160 reported deaths ii. In response to this flooding, the Local Women’s Handicraft (LWH) identified two communities in Nepal, the Karerey and Gogonpur villages in Saptari District, that had not received support from anywhere. These communities had severe damage to rice fields, houses, and livestock with approximately two thousand people impacted. 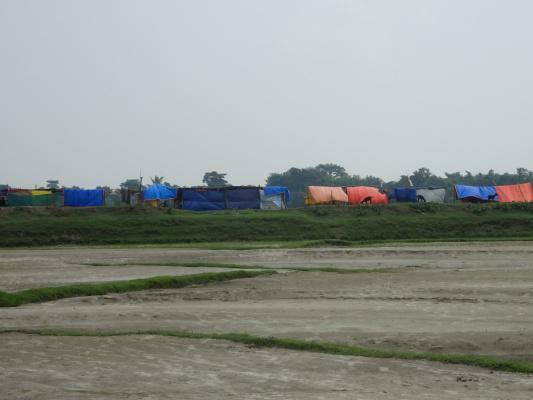 Seven hundred people are living in makeshift tents on a bank surrounded by their destroyed rice fields with no food, possessions or access to clean drinking water. The people from these villages were reliant on their rice and lentil crops as well as livestock such as goats and chickens. They do not have access to jobs or a cash economy. So when their houses and agriculture were destroyed by floods, they are left with nothing. On 20th of August and 10th of September, staff from LWH delivered aid packs to those impacted by the floods in Karerey and Gogonpur villages. With funds from donations, two hundred aid packs were prepared including rice, lentils, hygienic sanitary pads, medical supplies, blankets and floor mats. Each pack contains enough food to support a family for one month. Staff from LWH undertook an initial consultation with the affected communities and developed a list of families that were impacted. Packs were provided to the senior woman from each family affected to ensure equitable distribution and to empower local women. Community members set up a distribution station on the sand, that was previously their rice fields, to ensure orderly distribution. One by one, women on the list came to the distribution station, where community members supported LWH staff to give the aid packs. Saheen Sheikh from LWH provided an information workshop to the women from both communities about menstruation hygiene and the sanitary pads. Women from LWH have designed and developed a washable sanitary pad made from cotton that can be used for a number of years. Using the pad can reduce bacterial and fungal infections. This design can be copied by women in these communities to make more over time. It is suitable for women living in rural Nepal who do not have access to sanitary items or cash to purchase them. I accompanied Saheen and Majher Meye from LWH, as well as Daniel Matthews from England, on the distribution mission in September. I noticed that the roads had been severely impacted by the monsoon rains with many pot holes and ditches making for a bumpy ride. At one point we had to wait for 2 hours as the road was closed due to flood waters. At both Gogonpur and Karerey villages, the people were very thin and I could see the sadness and desperation of those who have lost their houses and livelihoods. I felt overwhelmed at the scale of loss and hardship. This disaster has significantly impacted children in these villages. Those who have lost their houses and food supplies are not attending school and have little energy due to hunger. Despite their tough situation, the members of the community were extremely friendly and generous and offered me water and shade. Community members waited in the incredible heat and dust for 4 hours for the distribution to finish showing their resilience and stamina. On receiving the aid pack, the smiles on the women’s faces were radiant as they were so grateful for the supplies. I could see that these supplies were the only way that those impacted by the floods would be able to eat and sustain for a month. In both villages, the women were shy to talk about menstrual hygiene and said that this was the first time they had received education on the topic. Despite this, they were very engaged in the workshop and were grateful for the sanitary pads. LWH is a fair trade textile and handicraft collective in Kathmandu, focused on empowering and educating disadvantaged women using sustainable methods. For more information please see their website: http://www.lwhnepal.com/. Last week LWH visited a rural school about 1 hour out of Kathmandu to teach the girls about menstrual health and sanitation, and to distribute our eco-friendly, fair trade sanitary kits. Here in Nepal menstruation still has a stigma surrounding it despite being completely normal in much of the world. This stigma means that 1 in 5 girls will miss school because of their periods. These girls have little understanding of the natural bodily function that is menstruation, with many schools simply forgetting to include it in their curriculum. When we approached the principal of the school to speak about this topic he seemed baffled at first, but kindly agreed to let us visit and distribute the kits. Out of all the schools we approached none had female principals, a reason, perhaps, why there is a lack of education about female health here in Nepalese schools. We had come to learn that this was the first time anyone had come out to this school to educate the students on the topic. The class giggled as we spoke about the causes of menstruation, how to look after yourself during this time. We explained what happens to our body when we grow up, and what causes the female body to react in the way that it does during ovulation. We also talked about the difference between reusable pads and plastic pads. The class was shocked to hear that a regular sanitary pad can take up to 800 years to decompose, and that they contain synthetic materials and chemicals that can cause allergies and harm your body. When we demonstrated how to use our cotton pads the class giggled again, yet watched closely, intrigued by the demonstration. Despite being shy we knew that the girls were benefiting from this and could then trigger the conversation with their friends and family. An action we hope will help lift the stigma that surrounds this topic in so many parts of Nepal. The reusable pads are made in our fair trade workshop using cotton, a material that can biodegrade in as little as 5 months. Each pad costs around $7 to make and eliminates a lifetime of regular sanitary napkins entering Nepal’s landfills. We wanted to find a way to empower women while also caring for our fragile environment. Once the distribution was over we interviewed some of the teachers and asked them how they felt about the talk and the topic. Many struggled with the stigma of menstruation as a child, with some even being a victim of Chhaupadi. Chhaupadi is social tradition that prohibits women from taking part in normal activities during menstruation. Menstruating women are thought to offend the Hindu gods and bring down a curse on their households if they remain indoors, therefore are banished out of their homes during this time. The women are kept out of the house and have to live in a cattle shed or a makeshift hut for the length of their menstrual cycle. Sadly, although outlawed by the Supreme Court of Nepal in 2005, the tradition is still common in rural communities, thus feeding the stigma surrounding menstruation in Nepal. The teachers spoke of their gratitude and hope for the future, but raised their concerns about a slow transition. We hope that in some way these talks and distributions will help to speed up this transition and contribute to a changing mindset here in Nepal. Our aim is to continue approaching schools around the country and speaking with them about this important topic, in order to make the women of Nepal feel confident about themselves and their bodies, while also raising important environmental awareness. A big thank you to all who helped to make this distribution possible. In 2013 an eight-story commercial building in Bangladesh collapsed killing 1,129 garment workers and injuring over 2,500. It was this tragedy that prompted the world to wake up to the adverse effects of fast fashion, an industry neglecting human rights and encouraging inequality. On April 24th 2013, the Rana Plaza factory workers were producing clothes for popular western brands, including Primart, Bennetton, Walmart & Mango. Clothes that were produced cheap - so cheap that working conditions and human rights were compromised. Four years on, brands like those mentioned above are still profiting from fast fashion, and despite pressure to increase transparency there are still many human rights violations and slavery occurring in the fashion industry. Fashion Revolution Week is a week to remember not only those lives lost in the Rana Plaza tragedy, but to also raise awareness about the implications that fast fashion has on our world today, both socially and environmentally. Nepal has become one country where western brands look to for cheap labour. It is estimated that 1.6 million children in Nepal are child laborers, and many garment workers (predominantly women) earn less than than $3 per day, with some only earning $1 a day. When Nasreen (founder of LWH) was just a child she experienced what it was like to be forced into child labour. She worked for 15 hours a day getting paid as little as $5. It was those experiences that inspired her to start LWH, and provide opportunity and empowerment to women in the garment industry in Nepal. Since then Nasreen has trained over 100 women in the art of textile production and helped them discover new opportunities in their lives. Many of the women have come from underprivileged backgrounds and been victim to the social stigmas that still surround women in Nepal, including stereotypical gender roles and oppression. You can read some of the women’s stories here. The women here at LWH have opportunity because they are treated equally. There is no discrimination at LWH, adhering to principle 6 of the 10 principles of fair trade - Commitment to Non Discrimination, Gender Equity and Women’s Economic Empowerment, and Freedom of Association. Fast fashion does not promote equality, and it does not promote fair trade. If you expect to purchase a new t-shirt for $2 how much do you think the garment worker was paid to make that t-shirt? Watch the 2 Euro experiment here and see for yourself. Fast fashion has created an expectation in the western world that clothes are cheap when in fact they are not. Somewhere, someone is paying. The global textile and garment industry (including textile, clothing, footwear and luxury fashion) is currently worth nearly $3 trillion dollars, yet workers and producers are still earning less than $1 per day. H&M hit £1.7 billion profit in 2016 with its 52 fashion seasons, while in Bangladesh garment workers earn £44 a month, a quarter of the nation’s monthly living wage. If, in the western world, we found out that someone was getting paid below minimum wage there would be an outcry, yet here in developing countries we turn a blind eye to it. Sure living costs are lower but that does not mean we should expect someone to work hours on end for $1. These people are artisans, carrying on weaving traditions from centuries ago and yet we believe we are entitled to pay nothing for these garments. How do you tell an artist their work is not worth anything? People still come into the LWH shop daily trying to bargain prices. They must see that a bag is not just a bag. It is craftsmanship, a work of art created by hand. The prices marked on these products are to ensure these artists get a fair wage. Every dollar bargained is a dollar taken away from an artisan, a human just like us. This is why the Fashion Revolution prompts us to ask "Who made my clothes?" and build the relationship between the consumer and the producer. This year we will be participating in Fashion Revolution Week here in Nepal. Last year during Fashion Revolution Week (18-24th April), over 70,000 people around the world asked brands #whomademyclothes?, which reached 156 million organic impressions (the number of times our conversation appeared in people’s social media feeds.). This means that people are starting to make a stand against fast fashion, and look at more sustainable practices such as fair trade and environmentally friendly production. Here at LWH we adhere to the 10 principles of fair trade, and we have also produced our own range of products made from recycled materials such as recycled Saris. You can view some of our recycled products here. You can also make a stand against fast fashion. Ask your brands “Who made my clothes?” or better yet, shop fair trade brands that you know are 100% ethical. We are the change and we are the voice. Celebrate Fashion Revolution Week with us at EVOKE Cafe & Bistro Kathmandu on April 29th. I love lord Shiva message. Once Parvati was in Shiva’s life, one of her objectives was to bring Shiva closer to the world, as she understood that years of meditation and Yoga would have given Shiva a phenomenal perspective and understanding of what is reality. She became a devoted student, she would ask Shiva questions about the cosmos, and every answer would spark even more questions. While Shiva would answer these, great truths would be revealed to the world. Truths, that Shiva had discovered during his thousands of years of meditation. Sitting on Kailasha (Kailasha is the mountain where Shiva lived and practiced Yoga and Meditation), Shiva explained Parvati the secrets of the cosmos, he answered every question that Parvati would have. While answering these questions, Shiva started coming closer to worldly matters, he grew curious himself as he would study and find answers for Parvati. Now Shiva always had Parvati by his side. With this message he also announced, “There shall be no worship, or Yagna, without a Man’s wife being right by his side. Ive been able to get thru to Nasreen a few times since I posted last. She has focused her time on making sure the women of LWH are taken care of. I was happy to hear that Parbati and her daughter Osika have been accounted for now along with most of the other women of LWH. I was heart broken to hear that most all of them are homeless now, some have serious injury’s (broken arm, broken back) and some have lost loved ones. The group from LWH had spent the first few days after the quake getting out to Goldhunga and getting people safe and settled at the LWH building. They all worked on cleaning up the collapsed divider wall and also tried to cope mentally with what has happened to them all the while with continuing after shocks happening. As of last night Nasreen told me they are still experiencing disturbing after shocks from the quake that really puts everyone on edge. She spoke of how traumatizing this event is to everyone, and how much devastation has occurred, it has just been impossible to take in. She has also spoke of the beauty that can come out of such a tragedy in the forms of many things. She told me that there are huge groups of 10 or more families getting together to cook meals and share the food they have, and also share human connection. Without the use of power or wifi everyone has really relied on word of mouth and sharing with each other the good and bad news. The lines that divide the caste system in Nepal and also between rich and poor are starting to disappear as everyone sees they are all destitute and need to rely on one another. I hear the warmth in her voice when she she speaks of these things but I also hear the cold distant feeling she has when talking about how overwhelming the situation is and how dire the need for aid has become. For awhile I think the LWH group was scared and trying to stay still in GD to take care of their family and friends. Now I can tell as they have slowly ventured out to talk with others as they have been emotionally affected and moved to help where they can. We spoke about how we could create a system of direct support for the people in need of the village. Currently Nasreen and the women of LWH have taken on the job of aid out reach, they are using the new LWH building in GD as a home base. They are venturing out in groups going home to home to help each person they see. They have been taking down their personal information, photographs and contact info. The LWH site is now set up to receive donations, these donations go straight to supporting LWH’s aid work on the ground in Nepal. We were going to try and post profiles of each family online with an amount needed, but reception is very spotty and Nasreen feels she cant take time to upload the info because she is needed in every moment. She said that all the information is being recorded and she will upload when she can and it will be posted on the LWH blog. There seems to be no time to get the needs of each family right now because it is obvious that food and water are the only needs to be focused on at this point. If you know Nasreen and LWH, you can support the type of human rights work their hearts are tied to, and this is the time to do it. In a tragedy like this LWH can be really affective at bringing direct relief and support to people that are currently not getting this. Being able to see photos and video online is nothing to the experience of being there and this is the best way you can put your energy with people on the front lines and connect with other human beings in need. Thank you all so much for the energy everyone is directing to Nepal, Nasreen and LWH feels every bit of your support and is doing the best at acting as a channel for this energy. The next 30 mins of my life crawled by as I tried to reach her with no avail and understand what had happened. Slowly the reports started coming in online about the earthquake and I plummeted into sadness and thoughts for Nasreen and all of my family and friends in Nepal. When River and I were in Nepal in January he had brought up the conversation about “what if” an earthquake hit Kathmandu? In our travels we are accustomed to working in dwellings made from simple brick, or old crooked buildings, janky make shift structures and not really thinking twice about an exit plan incase of an earthquake. We talked about the likelihood of mass devastation if indeed Nepal was hit by a large quake and pondered the question as to how the country could recover with limited resources and a weak public works department. We left that conversation in Nepal in the winter, it is now spring and these questions have been answered. I was finally able to get Nasreen on the phone 30 mins later. She sounded dazed and nervous, she happened to be in a big open market with a bunch of the LWH women that day and although buildings came down near them they were all able to escape injury. She said the force of the quake was so strong it through her down sending the phone we were on flying out of her hands, it was only later that a man picked up the phone and returned it to her was she able to receive my call. She was immediately thinking about her shop, the LWH building, and all her family and friends that live at and use the facilities everyday. Had the building collapsed, was anyone inside? As I talked with her 4 more after shocks hit and I could hear screams of fear in the background. Nasreen and the group she was with chose to wait it out in the open market for hours as the after shocks kept coming. It was later they joined a group on the lawn of the vice president of Nepal to share in some warmth for the night and protection from the crumbling structures everywhere. That night the rain came and saturated everything and everyone, when I talked with her in the morning I could her the toll the night had taken on her, the anxiety produced by the continual after shocks, the crying from people around her, she was overwhelmed with it all and coming down from shock. As I read more and more about the quake in the press I started to see familiar places I new very well in complete and utter destruction, the district of Thamel has been hit very hard. I also read about a conference that was held in Nepal just a week prior with “50 earthquake and social scientists from around the world” who had come together in discussion as to how to better prepare for a quake like this. Unfortunately to little to late for the people of Nepal. When I got thru to Nasreen next she had gone to the shop and surveyed the damage, LWH shop in Poknajol was still standing but has suffered from some large cracks in the building, she was heart broken to see some buildings around her had collapsed and killed some of her neighbors. After inspecting the situation the group decided to move themselves out side of the city to the LWH building project in Goldhunga village. It is there where they have decided to stay as they have fresh water from and open spring, an electricity inverter that was charged, some food supplies and safety in the open area away from crumbling buildings continually hit by aftershocks. When I spoke with Nasreen this morning she had spent the day with her group going around the village of Goldhunga giving aid to people and documenting what they needed. I could tell in her somber tone that the sadness of it all had really started to sink in and she was feeling for all the people suffering. She did say that overall the people of Nepal are all just trying to help each other, in a country that survives each day hand to mouth there is no time for anything other than just picking up and moving on moment to moment. To everyone that has contributed to the ongoing building campaign in any way for LWH through Offerings or any of the other links, THANK YOU! The building is now serving as a hub for the village to share resources and assess the damage and aid needed in the surounding areas. I will be writing more about this as the days go on, I can say that some of the women are still not accounted for at LWH, one of who is Parbati and her daughter Osika. These 2 are particualry close to our hearts and we hope they are safe and secure and just not able to get thru on the cell networks. I will be updating again in the next few days as things progress. Today is a major turning point in my life. We are multifold steps closer to achieving the LWH dream! Witnesses include the women of LWH, and friends, whom gathered at the opening of LWH house located in outskirt village of Kathmandu. It was a beautiful sunny day, a wonderful timing for the opening. Two rooms are set to go in the new LWH; the rest remains in progress. Full completion is targeted for within the next year. Patience pays off, and the perfect example sets instant before our eyes! We decorated our first ready to use room, by having the sewing machines in place and tied with balloons to signify their rebirths. The women made the first crafts at this new LWH, on its open deck under the gentle sun. This open deck will be topped with upper floor, to increase the additional working space and storage for LWH. I target to provide opportunities to more ladies for their skill practice. The thought of it excites me lots! LWH, at last, has its independence – a house of its own, and detached from rental in the city. Solely the shop remains in city, while the factory and cutting room have been relocated to the new LWH. As we set up the factory and cutting room, many recollections surfed in my mind. I recalled the inspirations behind establishing LWH, and the struggles on this long path. The journey appeared impossible initially, yet I insisted on to be true to myself, and the world responded positively in most cases. Every step is a lesson, and I was prepared to take challenges. I am well aware without it, life is motivated barely an inch ahead. In times of desperate needs, somehow, somewhere and someone gave me a hand. The outcome was, unexpectedly, as of a leap ten steps forward in touching the goal. Generous supports, encouragement, love and even the simplicity in kindness, pump and guide me and LWH forward with minimum tripping. I am constantly amazed by this beauty resulted from persistence on completing what seemingly was zero solution in the beginning. Our shop and factory were repeatedly endangered of shutting down due to minimal understanding from the landlord on the intention behind LWH, and threat of raise in rental cost kept us on nerve line. Yet from today on, we no longer need to face this adversity, LWH has its own home to sustain its creativity and crafting. We look forward to presenting more to customers and to inspire individuals! While some recollections of the past still bite emotionally, and I feel sadden by the problematic gender issues prevail in my society, I pray that the existence of LWH inspires individuals to contemplate and execute what is honorable and fair. I am neither a feminist fighter nor aggressor, but a female standing up for fundamental gender rights, and providing work and skill opportunities to disadvantaged women. Though receiving academic education has become more common than generation before in this country, yet the aspect of social education requires much design and upgrade. LWH stands, too, for this mission, to educate women to acquire practical skills and transform into a method of sustainable living. I recalled prior to entering teen years, I first presented myself to Kathmandu. It was a cultural shock; it took me two months before I could push myself to stare out the window without feeling awkward. Due to the social atmosphere of which I was accustomed to from my home village, the public scene of young and old making frequent appearance was unimaginable. This collapsed when I saw Kathmandu, and I realized females have just much right to be integrated into the real world. With this image, it ignited me to have a dream and join the world outside of village. Today, this dream is many partially fulfilled but remains ongoing. The new LWH signifies not merely a new era, a rebirth, and independence but a bright future with many dreams aim to turn from hopes to plans, and to live action and living. In live and written words, our gratitude to everyone for their support never comes to end. Repeatedly I said to myself and to our women that our living dream is possible because of the global friendship and generosity. We deeply appreciate and cherish this heavenly present! As we looked at the new LWH, it is one of the wonders whom friends and the world have given us. We invite you to come visit our new home, and share the excitement! First time in the sky. Lots of mixed awkward feelings yet interesting encounters engaged with first time in the sky, and what followed. I hear and see airplanes fly over Kathmandu daily. To me, they are closer to angel-like because they have wings, and I do not, obviously. Thanks to a sponsored trip from Offering based in the US, I received the chance to be on plane for the first time, to travel overseas for the first time, to see the ocean for the first time, and many more first time witnessing and experience. It all began with first time in the sky, from Nepal’s Tribhuvan International Airport and proceeded to destination, Bali Island of Indonesia. I was already over excited and nervous even prior to boarding the cab for airport. That was, when I first received the electronic air ticket from Offering ; I was going to fly and travel, at last! While normally, I am not a fan of science, however, the moment I stepped into the airplane and the second it soared into the sky, I was amused. Science is incredible, it invented unfavorable destruction towards certain nature yet it also shaped the conveniences of sky travel. I must admit I began to enjoy the sweets created by science! As the plane soared high, I was in the sky, and ‘wow’, I repeated in the mind. Not certain the right words to express this amazing feeling, and surprisingly, I managed to sleep with the excitement remained in my dreaming. I wish I had the entire LWH team with me on this overseas trip, and someday, within my capability, I aim to make it happen. I desire for my ladies to receive the opportunity to learn via experiencing the exciting unknowns and differences at overseas. It is not about leveling myself or them to have the travel leisure, but learning to be humble and tolerant towards those and the society whom much differed from us. That, in fact, was a test while I was in Bali. In my culture, there is very little chance to witness individuals presenting themselves with less modest dressing. But in Bali, being one of the top beach vacation spots on the globe, such sight is inevitable. It is an island, after all, and there are beaches, nothing strange about individuals in comfort with their swimsuits and even bikinis on. If I was to dress like how I usually do in Nepal, even if I do not suffer from weird stares, the heated temperature would have knocked me down regardless! Initially, I was somewhat emotionally judgmental aimed at cultural shock. I, then, realized, shamed on me for thinking problematic – why mind the differences and why not be tolerant. To dress or not to dress is an individual right and freedom. I reminded myself that I love to travel because I want to see how the world operates, and differences to be witnessed are expected! We accumulate humbleness as we see and encounter further, and this well applied when I saw the grand sea before me at Bali. It was my first time to eye capture the vast amount of water horizontally and vertically, and the ships of small and big. Ocean is just as grand as the Himalayas back at home, I mumbled! I see the grand snow-capped mountain range from distant in Kathmandu, and I am aware if I am to approach them closer, I would not be qualified to even be elf when stand with them side by side. It is a cliché to say so humans are tiny before the nature, yet modesty towards it appeared to be skipped in modern days. Again, it came to my mind that we need to protect our nature more than the attempt to control me. While I enjoyed the wonder and magnificent view of the sea, concurrently, it was teaching me to be humble. I am not to contribute to destruction of the beautiful shore and sea, and this applies to the nature in my country, too. Needless to say, I am against litter, and nature damaging behavior. Embarrassingly to say, these ill social behaviors have yet to become slim in Nepal. Many first times on this trip, it was an amazing outdoor classroom. I missed the trip the moment I landed in Tribhuvan International Airport. On the other hand, the moment I arrived at Bali, homesickness attacked me. I missed my friends, and tears spread on my face! Another first time from this trip was returning alone on flight returns to Nepal, I had never traveled on the road on my own, not even in my own country. Although I was sad to bid farewell to friends at Bali, for the gathering was amazingly great, I managed to fly alone without fear, and at the end, I was proud I achieved it. It was hilarious, and warm-hearted, during flights and transit in Kuala Lumpur International Airport, respectively. I thought I had locked myself in the washroom while relieving myself from nature’s call on the plane. “Oh my goodness!”, I panicked, and madly, knocked, pressed and twisted any buttons and handles to get myself out. Yes, I got released without anyone to come to my rescue, and I laughed out loud for this ridicule I self placed. My heart was warmed in puzzling when a stranger suddenly offered to pay my bill for the gifts I bought for friends at Kuala Lumpur Airport. It was too good to be true but it occurred. First time in the sky enlighten me plentifully, and strengthened my love to travel more in the future. With the best company, Roger, River, Ben and Lindsay, anyone could have, came with abundant laughter anyone to light my first times, I thank, again, to Offering Company for the treat. The first time overseas has served as the ultimate outdoor classroom, and I have come to appreciate science and nature more. A toast to the many first times within this first time! I sadly have to share that the insults and complete lack of faith in our work as women continues . I had a negative encounter once more that brought me to tears . No matter how many times it happens it never gets easier. Why do people exist out there that seek to being others down ? In this recent instance it was - as is often the case - assumed my success is due to my 'going to the guesthouse' , implying I am prostituting myself . And yes men in Nepal feel entitled and arrogant enough to express this outrageous and mysogynistic claim . 'How did you get the women?' They ask. 'Who handed you the money ?' How dare they . Even though these comments make me want to work harder for our cause , I can't help but feel rage that they even exist . Have they no idea what I have done to get here? No. Still it is always assumed I did nothing . I am a leech, a thieft , a prostitute. Yet a man works in the black market , takes money from his rich corrupt uncle , and he is still a respectable man just doing what he must to survive and succeed . The double standards are still so frustratingly strong . Another way in which We at LWH continue to live under the power men hold over us is how the threats continue to grow as we move up the ladder and gain notoriety. I am given larger offers, yes, but at grossly undervalued prices because I am a woman and it is assumed the person offering is doing me a favour. I am always commanded . But I refuse to devalue my products no matter how Amazing the offer. I am tired at these attempts at being squashed. I am feeling always at risk of being Sold out or Bought out as people see profit making potential in our growth and notoriety. Tourism , especially charity and voluntourism are huge industry in Nepal. And peoples mouths begin to water when they see that we've been written about in Forbes . I want to celebrate Our climb up the ladder but still I feel like a slave . Every decision I take very seriously, and I understand that the desire for others investment in our work could easily eliminate us. Instead I continue to consult the women on all major decisions as our continued independence is our central priority . Further , I want our growth to benefit local people not international business men and entrepreneurs. What is even more disturbing is that even my handling of various offers puts me at risk, as I still live in a society where women do not dare act firmly in roles of authority. Must I always censor every decision and careful action? There are so many people with so much wealth, It pains me to be low balled and undercut. I do not want to sell out and start producing low quality for the sake of quantity . It is so important that we do good solid work in material and in the substance behind the physical product . I do not want to sell out and start producing low quality for the sake of late quantity. I refuse to do mass profit making orders .Why do people push for that one dollar from me when they sit a top a mountain of them ? Do they want poverty to continue ? It also pains me that people could even dream of using our cause for profit . Once more as we climb the risk of falling increases . Are we really a threat ? Will I ever be without fear of losing everything we have built ? Will I ever be able to just put energy into our project rather than struggling with these various energy draining affronts ? I am being pulled away from these negative and scary encounters when there is so much more I need to do here . The work and responsibility is perpetually piling up. Yet We are constantly challenged by the conflicts rife against all women in Nepal . I can't help but worry about the potential for harm to our project as people are afraid of what we symblize for women and society . How can I continue to handle such great power as such a small fish ? As I continue to hold sting and true in our ideals I am still afraid . I have no connections , no rich uncle , no brother in government , nothing to back us in case We fall . I am tired of having to think the worst in others . Many people make this world dark . I came from huge hardship . My struggle has been huge as has all of ours . No one in my family or village is educated ... How to hold the strength to challenge the wales and sharks in this great sea as just one small fish ? combine your christmas present with a good cause. Hello hello to everyone around the world! We are in urgent need of some donations, and we have created Christmas parcels of different sizes - see attachments for the donation give away's. Please read the following to get a better idea, and please forward it to your friends! Local women’s handicrafts (LWH) is a Fair Trade women’s sewing collective in Nepal, dedicated to the radical advancement, support and education of women’s rights in Nepali society. We currently employ 22 disadvantaged women who fled their homes, are widowed, or left by their husbands. We also emphasize on employing young women who came to Kathmandu to study but lack the necessary finances – being aware that it is these educated women who are going to change the future. Almost every week a women comes to us begging for a job, but we have to turn them away. We do not want to turn a single woman away who is in genuine and urgent need of help, money, independence, and a livelihood. In June 2014 we started to build an extended working and living space in a quiet village area 20mins out of Kathmandu. Our aim is to provide education and job opportunities for 1000 women and more. The total costs for this building is approximately $65000. A strong determination to empower Nepal’s women, and the support from our friends from all over the world are slowly making this possible – but we need YOUR help as well. We have created Christmas parcels, each containing a variety of handmade items from our local women’s group. We are offering different sized parcels for a donation of $30 (USD), $50 or $100. (including shipping costs). We do have a PayPal account. The items we will mail to you will be perfect little Christmas presents for your loved ones – why not this year combine thinking of your loved ones with thinking of those in the world who are less lucky than us? So much of what we gift today has been created through pain and disenfranchisement of the underprivileged: let this year be the year that we give items created by and for the reproduction and reclaiming of LOVE. Have a look at the different parcels – colours and design may vary, but please tell us your favourite colours!